I am a personal user of the derma e® skincare line. I’ve been using the brand’s face wash every day for at least three years now, and love the scent and the texture. Yet, more importantly, as the month of April focuses on Earth Day and green living, the brand itself is eco-friendly, which is why I am featuring them this month as, in my opinion, one of the best eco friendly skin care products on the market today. A factor about derma e® that maintains my brand loyalty is that it’s family owned and operated for 30 years, with a variety of awards under its belt. Manufacturing and operations are offset 100 percent by wind power, and the product containers are 100$ recyclable. It is a green brand, inside and out. Yet, the products, while beneficial to the earth, are also beneficial to your skin. The derma e® natural skincare products are 100% vegan, cruelty-free, paraben-free, sulfate-free, mineral oil-free, lanolin-free, gluten free, and GMO-free. Those factors are why I started using the brand when I became pregnant a few years ago, and was nursing thereafter. Since then, however, the green factor for my skin and the environment has become an important part of my beauty routine and I’ve been a consistent fan. I’ve tried other products and have enjoyed them, but when it comes to the derma e® face wash, in particular, I stick with it. It is worth every penny. You can find the brand at leading retailers like Whole Foods, Sally Beauty Supply and CVS. You can use this tool to find stores in your area. You can also purchase directly from the derma e® website. 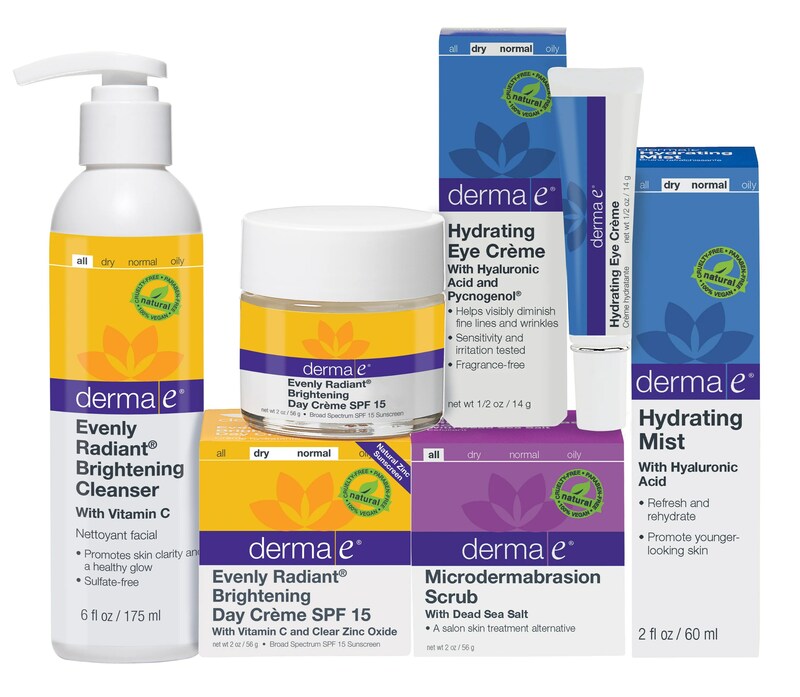 In honor of Earth Day and this eco-consious brand, I’m pleased and honored to offer a giveaway of derma e® products to one of you (Value $112.50). You’ll win all of the products shown in the picture above! I hope that you’ll be a brand convert as soon as you try it too! For other ways to go green this Earth Day, click here. Then don’t forget to check out the other giveaways I have going on here!